Actress Sayyeshaa Saigal, grandniece of Saira Banu and Dilip Kumar, married actor Arya as per Muslim traditions in Hyderabad on Sunday. Sayyeshaa, dressed in bridal red, was photographed on the stage with her family including Saira Banu, who looked graceful in a black saree. Sayyeshaa's wedding ceremony was preceded by a sangeet ceremony and a pre-wedding bash in Hyderabad's Taj Falaknuma Palace. 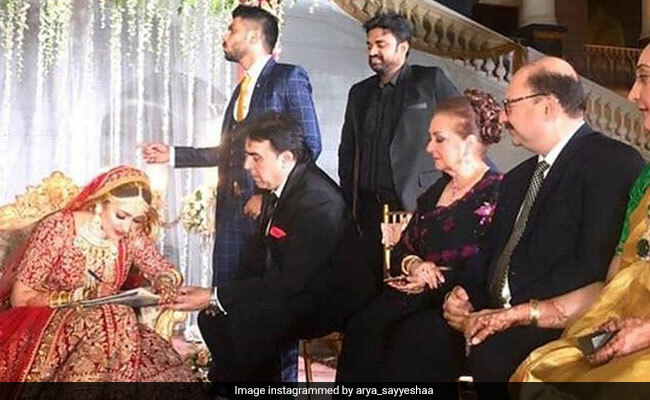 Over the weekend, a picture of Saira Banu dancing with her niece Shaheen Banu (mother of the bride) during the sangeet ceremony went crazy viral. Sayyeshaa Saigal, is best-known for her role in Ajay Devgn's Shivaay, met Arya when they were filming 2018 film Ghajinikanth. Meanwhile, this was Sayyeshaa and Arya's look for the pre-wedding bash, which was also attended by south celebs such as Allu Arjun, Suriya and Jyothika. Sayyeshaa debuted on the big screen with Telugu film Akhil (2015). She is the daughter of actor producer Sumeet Saigal and actress Shaheen Banu (Maha-Sangram and Ayee Milan Ki Raat), niece of Saira Banu. Sumeet and Shaheen were married from 1990 to 2003. Meanwhile, Arya has starred in films like Arinthum Ariyamalum (also his debut film), Naan Kadavul, Madrasapattinam, Raja Rani and Arrambam. Sayyeshaa Segal and Arya are co-starring in KV Anand's Kaappaan, slated for October 2019 release. The film also features Suriya and Mohanlal.